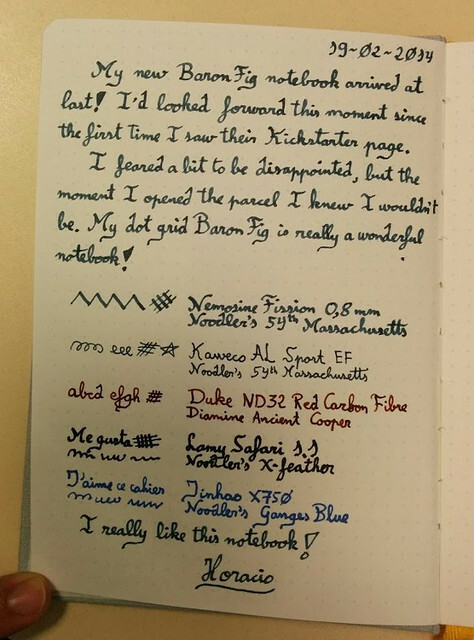 Several months ago, I backed the Baron Fig project on Kickstarter, a humble project that asked for $15,000 to make high quality notebooks for sketchers and writers and got almost $170,000. 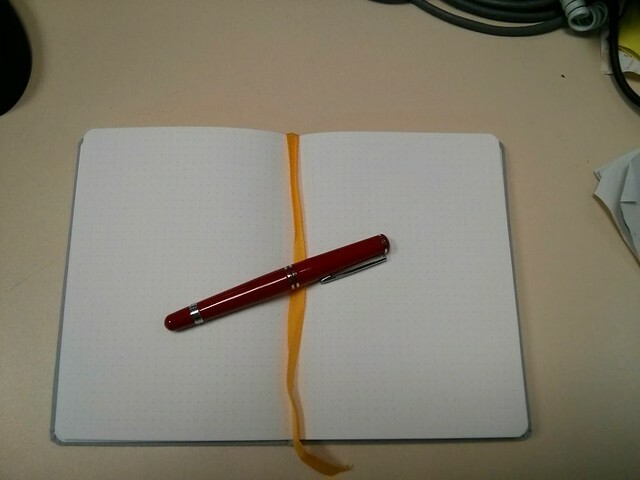 Two weeks ago, my Baron Fig notebook arrived at last! I'd looked forward that moment since the first time I saw their Kickstarter page. I feared a bit to be disappointed, but the moment I opened the parcel I knew I wouldn't be. 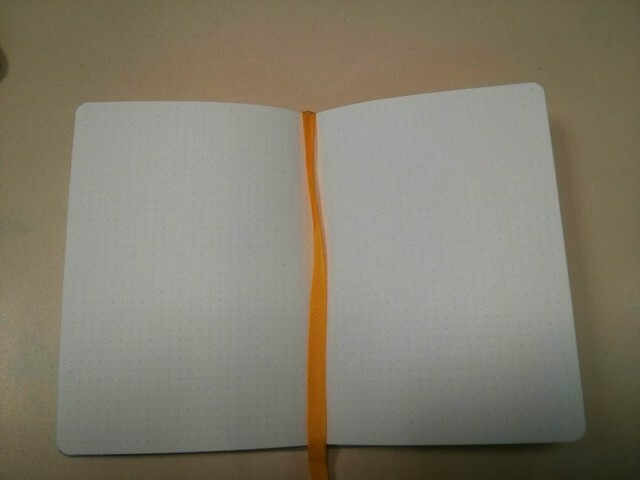 My dot grid Baron Fig is really a wonderful notebook! I'd asked for the Dot Grid model, I like a lot that pattern. It came inside a beautiful red-brown box. 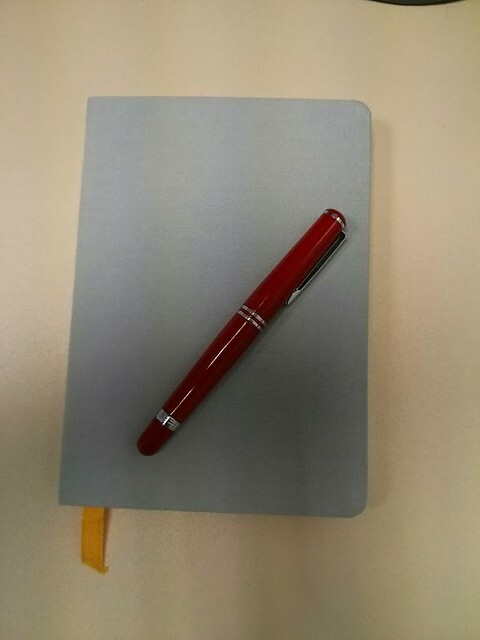 The cover of the notebook is a nice textured grey fabric. The dimensions are approximately 19.5cm by 14cm, a little smaller than A5 (21x14.35cm). 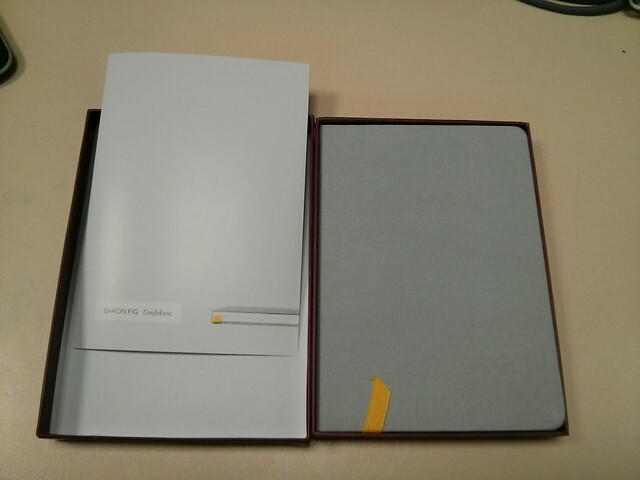 As promised, the notebook lays flat when open, a good point for me as I find more comfortable to write on notebooks that remain flat. It's a great notebook, small enough to go everywhere in my bag but big enough to write a lot on it. The paper has a nice off-white colour, more agreeable on eyes that a shiny pure white. 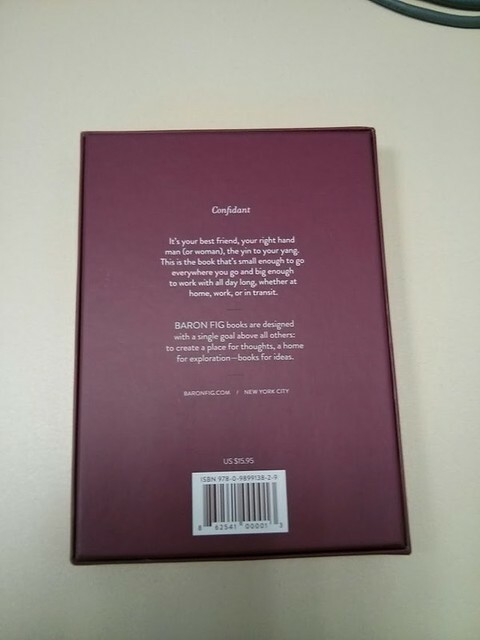 It's 100gsm paper, The pages have a good feel and I’ve confirmed with Baron Fig that the paper is high quality 100gsm, and it's very fountain pen friendly. I did not notice any feathering even with juicy 1.5 stub nibs. Of course, this review is based on my personal feelings about what I seek in a notebook. 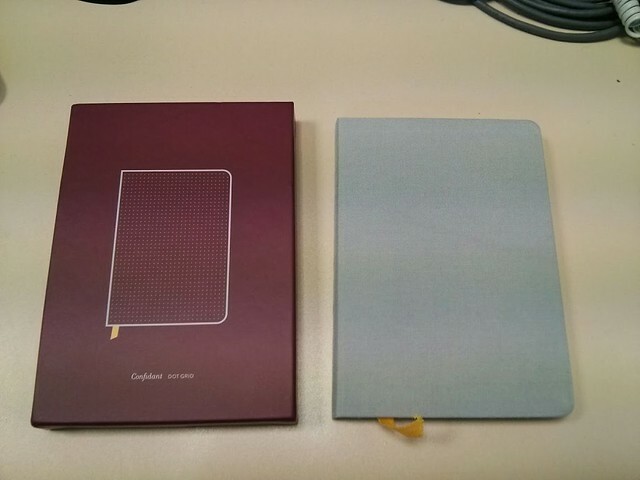 If you have any question about the Baron Fig notebook, please leave a comment, I'll try to answer it quickly. 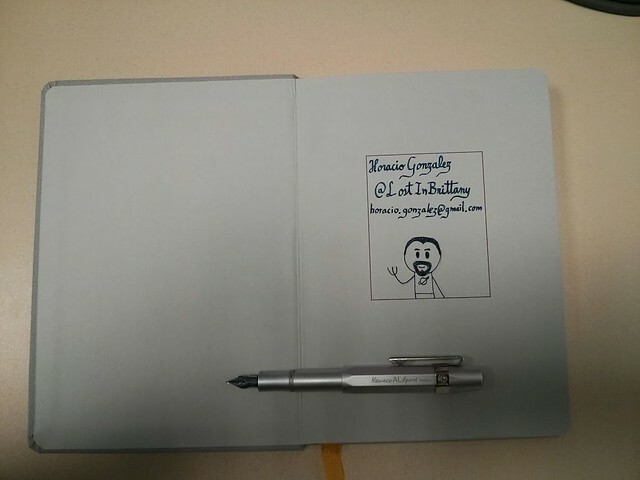 The review was also posted in LiB Pens, my fountain pens, ink and paper blog. 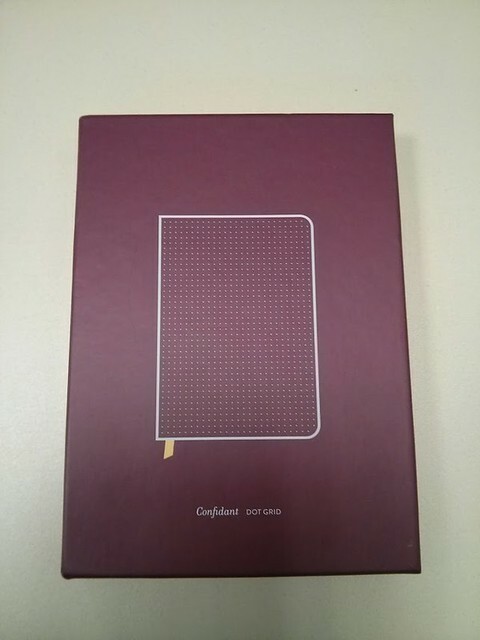 Will the notebook be available in other sizes. The one you review is too small for my needs. Go to their site, they are quick to answer all feedback. Very nice! I might have to get one of these. It is a big pet peeve of mine when a journal won't stay flat so this one might be right up my alley. $20 if you preordered via kickstarter, it's only $16 with free shipping online now. I guess that's a good thing for regular shoppers. This looks like a good journal at a good price, but kind of a bummer for the folks who funded the startup.